The articular processes or zygapophyses (Greek ζυγον = "yoke" because it links two vertebrae; απο = "away"; φυσις = "process"), are projections of the vertebra that serve the purpose of fitting with an adjacent vertebra. The actual region of contact is called the articular facet. The Articular Facet concert series, initially presented in Chicago in 2011, began in pop-up galleries, DIY spaces, and rock clubs. To fill the need for a new series which presented electroacoustic compositions and structured improvisations, Chicago composer Julia A. Miller brought together diverse artists: composers, improvisers, dancers, sound artists, instrument builders. The series reflected the use of ancient, adapted, or hacked technology, invented instruments and performative objects, and the incorporation of the visual and physical into the sonic. It was intended as a format for the presentation of chamber works, to build repertoire and techniques for larger ensembles and larger projects. The Articular Facet series had roots in the long term collaborations between Julia A. Miller and fellow Chicago composer Jeff Kowalkowski on the New Music at the Green Mill series - a Chicago new music institution. The series also had strong ties to the work of the Chicago Scratch Orchestra, a large group of individuals spearheaded by Jeff Kowalkowski, Julia A. Miller, Dan Godston, and kg price. Conceptual artist Ryan T. Dunn worked on the Articular Facet series, and was a pivotal participant in the opera performances. A timeline-in-progress of these various projects stretches back through the early 2000's. Inspired by one volume from a set of decommissioned library encyclopedias, as well as the Europeras of John Cage, Chicago composer Julia A. Miller assembled a large work from the Articular Facet chamber ensembles. 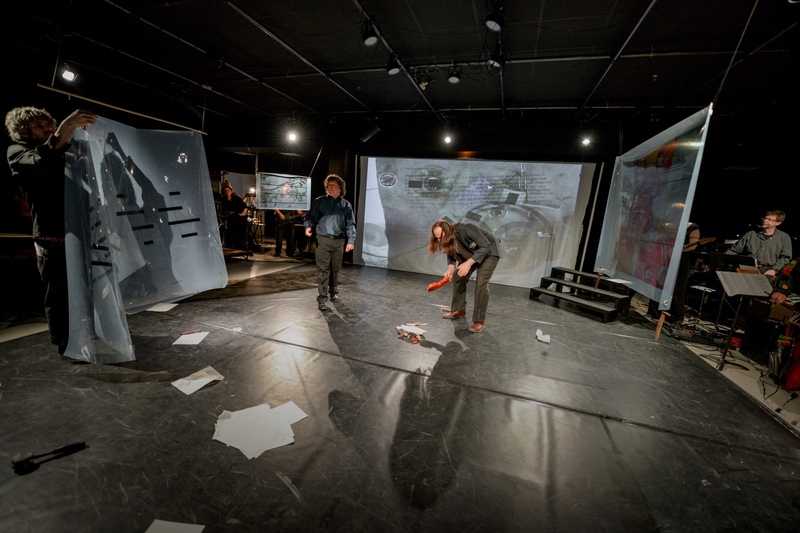 Since 2012, Articular Facet has presented four performances of Miller's site specific improvised opera Dissecting Adam - two simultaneously with San Francisco composer Gino Robair's I, Norton. Together, these two works became Dissecting Norton. Countless additional chamber performances, ensembles, and bands have resulted from the regular, direct contact of these skeletal formations of artists. In 2015, Articular Facet has evolved into an open culture collective of accomplished musicians and artists willing and able to push boundaries and experiment with ambitious long term and large scale creations: new forms of opera and works that bring together multiple media and collaboration for the sake of the articular process. Early Warnings: Mark Hardy on the Home Theater Festival in May, and summer collabs with Gino Robair and Gerhard Stabler/Kunsu Shim. Check out our events page for more info. Profile of composer Jeff Kowalkowski's work with students at DePaul in music and community outreach; artist Julia A. Miller in Prepared Guitar; sound artist Eric Leonardson in the Chicago Tribune! A great review in the Reader of Articular Facet at RhinoFest, performing Nicolas Collins' "Bracken" and Mark Hardy's "Hound".